Cook broccoli rabe in a 4-quart pot of boiling salted water. (pinch of sea salt) uncovered, until tender, about 3 minutes. Drain well in a colander, then chop. Cook shallots and garlic in 1 1/2 tablespoons oil in a 10-inch heavy skillet over moderate heat, stirring, until garlic just begins to turn golden, about 1 minute. Add broccoli rabe and cook, stirring 1 minute. Put slices, oiled sides down, on a work surface, then divide half of cheese between 2 slices. 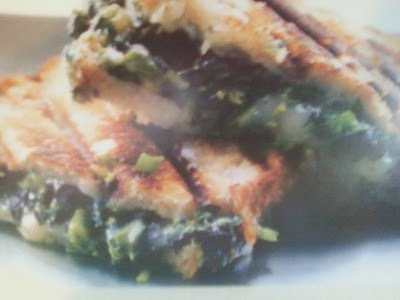 Top with all of broccoli rabe mixture, remaining cheese, and remaining 2 bread slices, oiled sides up. Put sandwiches on press, then pull down top onto sandwiches and cook until sandwiches are browned and crisp, 4 to 8 minutes. (Is using grill pan put a heavy pan on top of sandwiches and cook, turning sandwiches over once. Serve Hot and Steaming!! Great!!! So nice to eat on a Chilly Afternoon! Hot off the Grill...Steamy Hot!! Made With Soy Mozzarella!! All Vegan! !